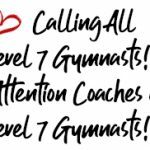 NAWGJ-SC is thrilled to bring your Level 7 athletes an exciting opportunity! 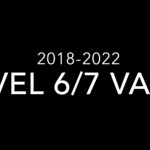 NAWGJ-SC will be selecting a team to participate in the National Judges Cup in the Level 7 Team Challenge event. The meet will take place onJanuary 5-7, 2018 in Portland Oregon. The athletes from various teams will compete as “ONE” representing Southern California. This is similar to the state team session at Level 7 Regionals. NAWGJ-SC will pay for the cost of travel, hotel accommodations, and entry expenses for a team of 6 athletes. Competition leotards will be provided by k-Bee. NAWGJ-SC will pay for coach’s travel and hotel expenses; however, no more than 1 coach per 3 gymnasts from the same team. All travel will be booked by NAWGJ-SC. 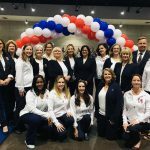 Athletes will also be accompanied by a female chaperone (NAWGJ-SC Board Member/Judge) who will be responsible for all their needs. Should a parent choose to attend, no reimbursements will be provided for them. Every Southern California gym is eligible to submit up to 6 athlete bio/ videos for consideration. 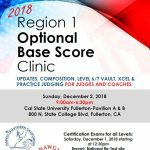 Routines will be judged by a panel of the NAWGJ-SC board members and the selected athletes will be notified by December 1. Team Selection will be made by November 30th. Coaches will be notified via email and/ phone. We hope you are as excited as us to have Southern California represented and show our SoCal strength and unity!